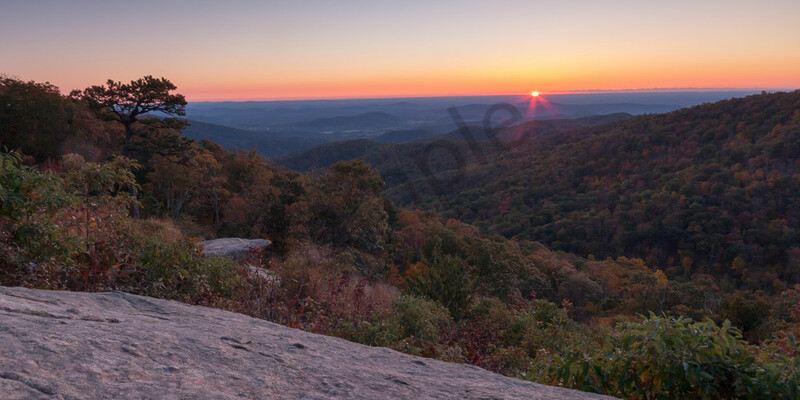 A fine art print of "Shenandoah Sunrise" will inspire you from your office or breakfast nook wall. The warm colors rising over the forested Shenandoah Mountains exude hope and excitement for the day ahead. A large stone ledge anchors the frame and provides a place for your virtual self to sit and enjoy the show! Shenandoah National Park is a great place to watch the sunrise. High above the valleys, the cool mountain air aids deep sleep and clear morning skies. The mountain ridges align for interesting compositions against the fiery backdrop. Skyline Drive is a roller coaster of a drive, punctuated with deer, bear and other wildlife. Rising before dawn, I am often rewarded with a stunning display such as this one. Morning coffee tastes much, much better from this vantage point! "Shenandoah Sunrise" is part of my Twilight Wall Art series. Best displayed on metal, the rich colors and bold textures come to life and captivate the imagination. Each metal print is ready to hang without a frame, providing a bold, modern look. For a softer, more pastel appearance, choose a canvas print. Two museum-quality fine art papers are also available, should you prefer a more traditional presentation.